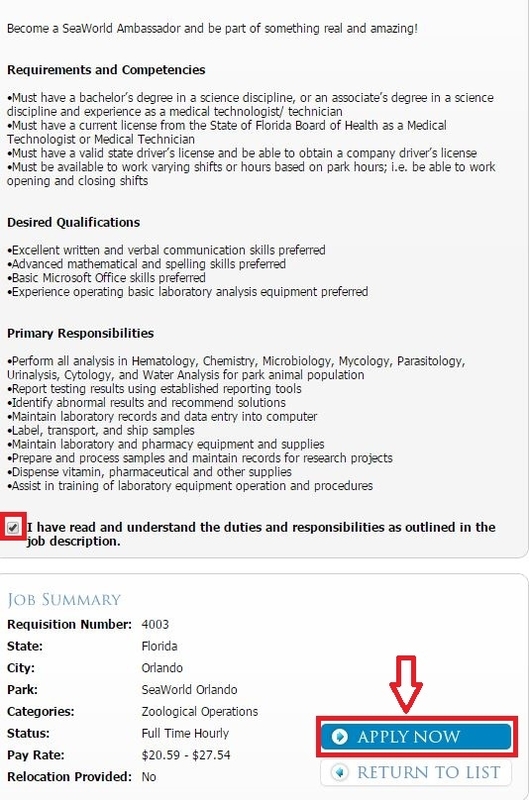 To apply for a job at SeaWorld, you have to visit the website careers.seaworldparks.com or seaworldparks.com/careers at first. Enter the key worlds in the box and select the state, city, park, job category and job status, then click the "Search Jobs" button to go to the second step. 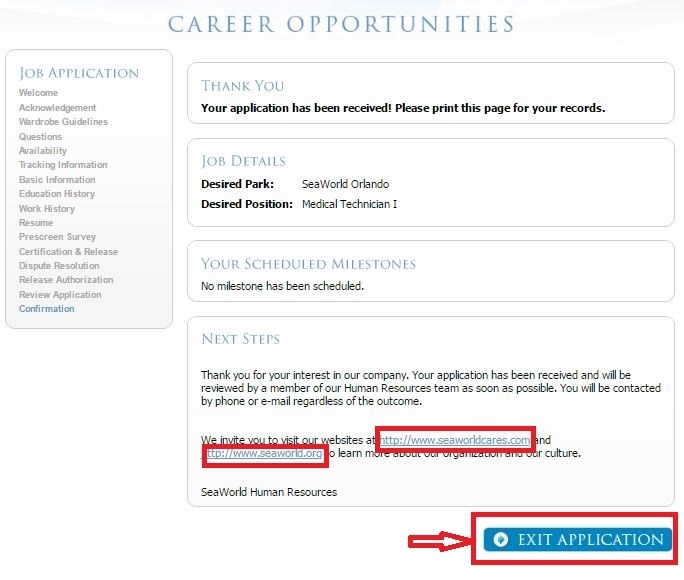 It needs to be noted that you will be asked if you have ever worked in SeaWorld when you click the button, and click "Yes" if you do have been hired by SeaWorld and on the contrary click "No“. 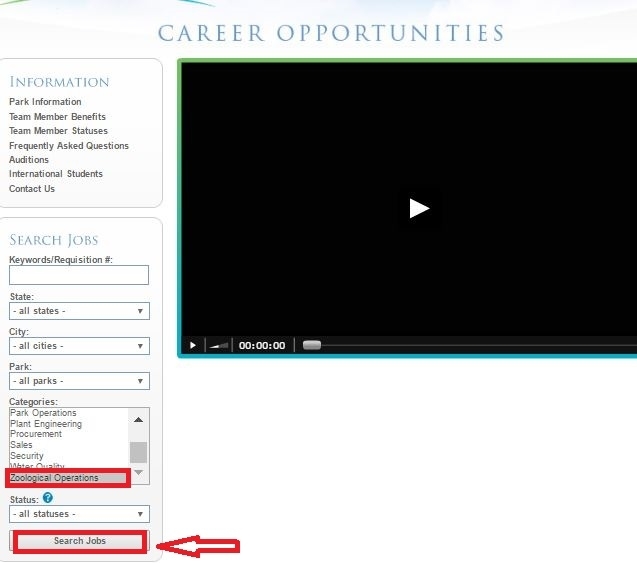 In this step, you will be rendered a search results page on which positions of the job category you chose are listed. Just choose one in accordance with your qualifications and interests by clicking the the title of the position. 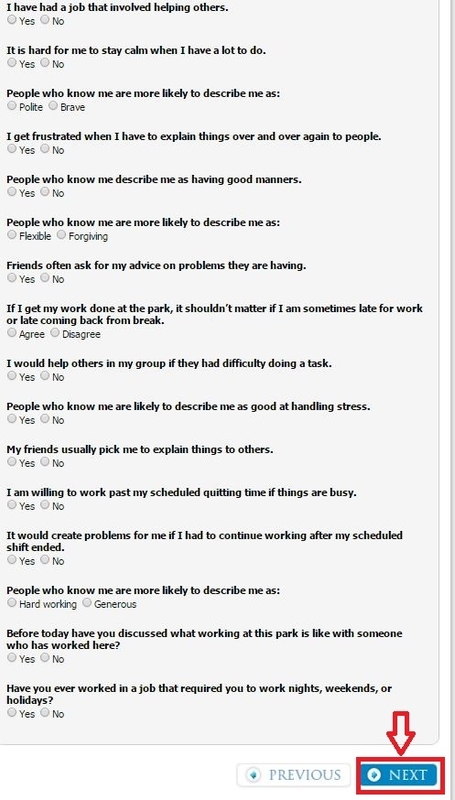 Here you will enter a job description page. Read it carefully to know about the duties and responsibilities of the position, which will make you clear about whether this position suits you or not. If you do want to apply for this position, click the APPLY NOW button to continue. You will go to a welcome page on which some information about the application are shown. 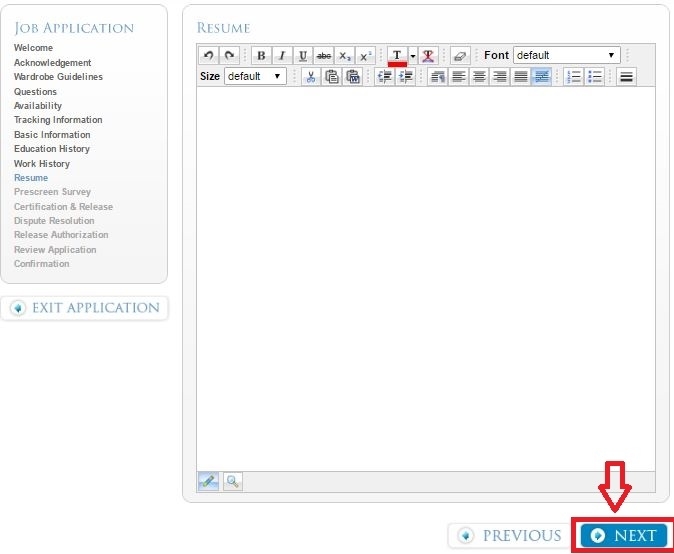 This step is very simple as what you need to do is to click the BEGIN button to get your online application started. This step is rather complicated but very important. You are required to read the acknowledgement and agree to the terms and conditions, read the wardrobe guidelines, answer all the questions, provide your availability and offer tracking information step by step. Due to the limitations of length and space, this article won't show all these steps in pictures. Once a step is finished, click the NEXT button to continue. You need to provide your personal information in this step to go on with your online application. Here your contact information, recruitment information, equal employment opportunity information, age group information, and application information are required. Besides, you have to offer your education history, school information and work history step by step. Make sure that what you provide here are valid and correct since they will decide whether your application will be passed or not. You are required to provide a resume to make your online application more intact. Write or paste it in the blank space, then click the NEXT button to go forward. 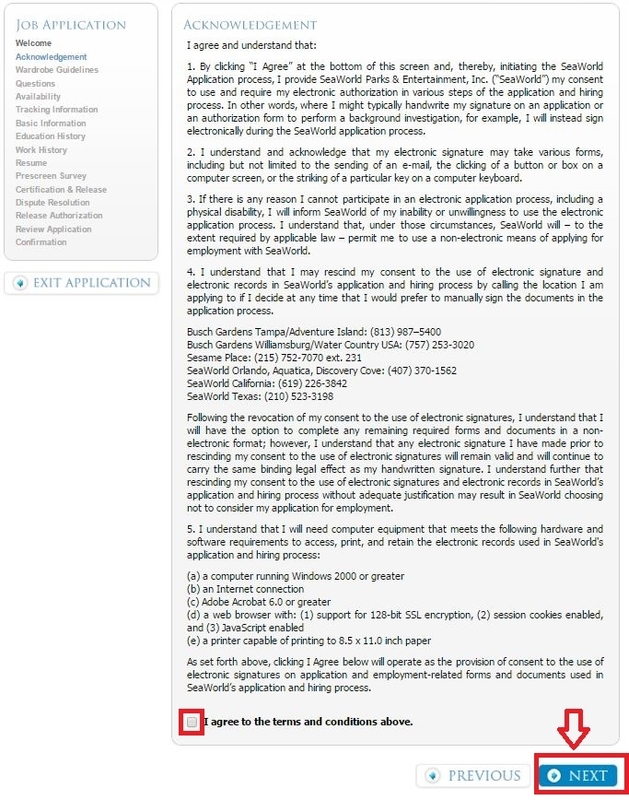 With your resume provided, you then have to get the left steps finished one by one including the prescreen survey, certification and release statement, dispute resolution, as well as release authorization. Click the NEXT button when you finish each step. You will be rendered a review page on which your application information is listed. Check it carefully and provide your E-signature, and then submit it by clicking the SUBMIT button if there's no problem. 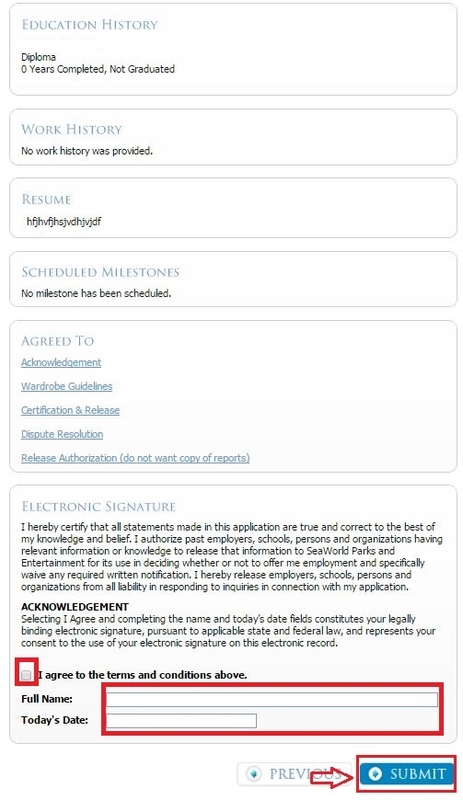 With the nine steps above finished, you've make your online application totally completed. 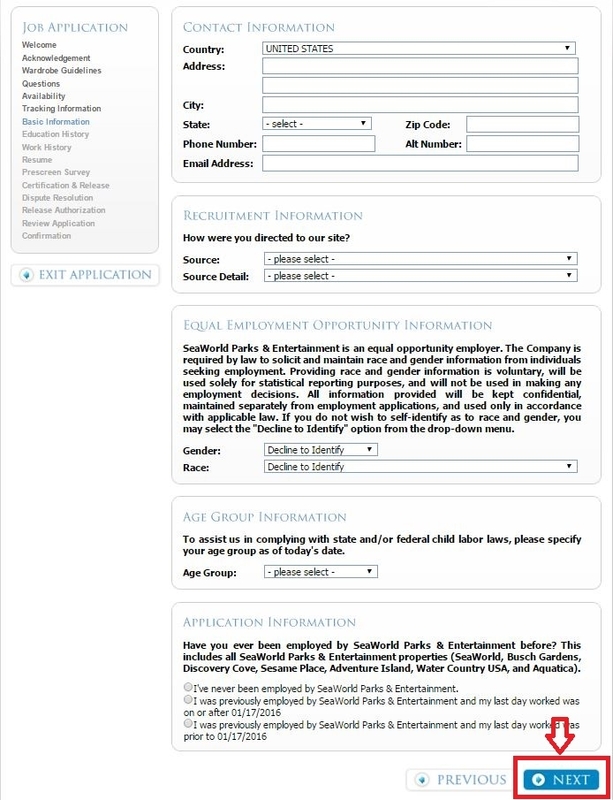 You can print your application for further use and learn more about SeaWorld by visiting the websites listed on this page. And you may also choose to exit the application process by clicking the blue button at the bottom of this page. 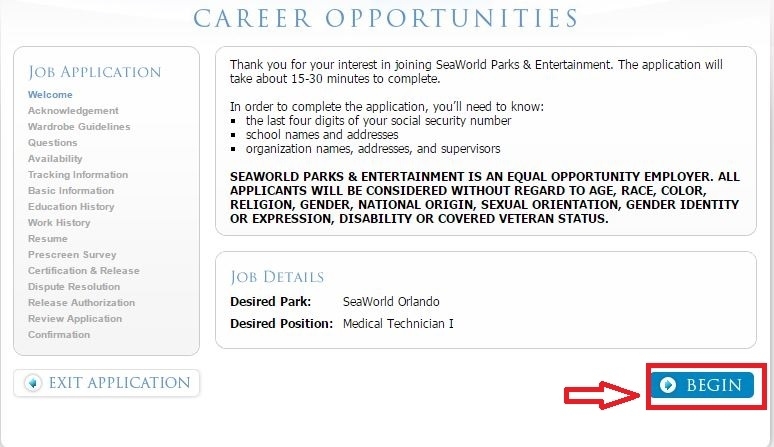 Click careers.seaworldparks.com to apply for SeaWorld jobs online.